There are several disastrous introductions of foreign species to Australia and the European Red Fox is one of them. Introduced in 1845 for "sport" it rapidly spread across the continent and since 1917 covered most of the area shown on the distribution map. 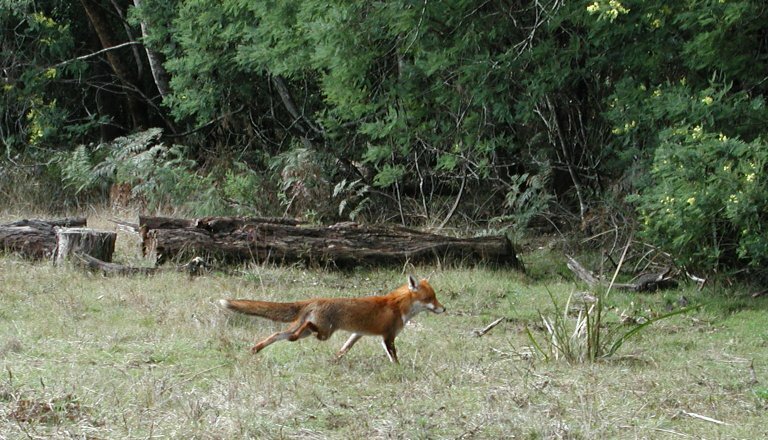 The problems foxes cause is preying on smaller native animals that were unaccustomed to such a cunning hunter. Apart from that, foxes are also scavengers and eat fruit, such as blackberries, when available. Foxes are shy and usually nocturnal, particularly in suburbia. It might surprise many from large cities how many foxes are living right under their feet. These photos however were taken in the middle of the day. In the first image I caught the fox sunning itself. Once it noticed me however it scarpered quickly, giving me a nasty look as it left. The other three photos are from inside a fenced area that was supposed to keep foxes out. It was a windy day and the fox was busy stalking prey so missed me stalking it. The last photo shows when it finally spotted me, after it caught it meal (plus some grass). Search for more Fox images using AllTheWeb, AltaVista, Google or Yahoo.